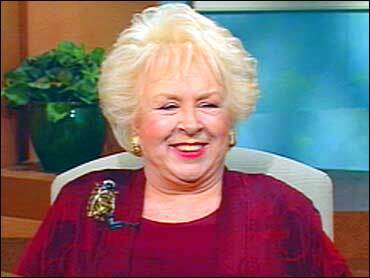 Her work on "Everybody Loves Raymond," as the meddling, caustic Marie Barone, has made Doris Roberts familiar to millions as a comedic actress. In "A Time to Remember," Roberts portrays an aging woman in denial over her contraction of Alzheimer's disease. Roberts tells The Early Show that the message of "A Time To Remember" is twofold. "It shows and makes people aware of Alzheimer's because in 1982, then President Reagan, declared this November National Alzheimer's Awareness Month. Little did he know that he would be coming down with the same disease," she says. "The other part of it is about family. I think we tend to spend a lot of time with petty peeves, old angers, old resentments and it's a waste of time. We fill our body with a lot of poison that way. And I think this movie tells you about communicating, stop judgments about each other, accepting each other for who we are and not who we want them to be. I think it has a great message." In "A Time to Remember," Roberts, a consecutive three-time Emmy Award winner, plays a mother on the brink of losing both her past and future. The Hallmark Channel Original movie event premieres Sunday, November 23, 8 p.m. ET/PT. And, on Monday, Nov. 24, "Everybody Loves Raymond" has a special Thanksgiving episode, which Roberts says is outrageous. Roberts made her stage debut in the mid-1950s in "The Time of Your Life," featured in Neil Simon's "Last of the Red Hot Lovers," worked in Paul Zindel's "The Secret Affairs of Mildred Wild" and Terrence McNally's "Bad Habits"
Roberts has more than 27 feature-film credits include "My Giant," "The Grass Harp," "Little Murders," "Used People," "National Lampoon's Christmas Vacation," "No Way To Treat a Lady," "The Honeymoon Killers," "A New Leaf," "The Heartbreak Kid," "Hester Street," "The Rose," "Such Good Friends," "The Night We Never Met" and "All Over the Girl"
Among Roberts television film credits are "The Diary of Anne Frank," "It Happened One Christmas," "Ruby and Oswald," "A Time to Heal" and, on CBS, "1,000 Men and a Baby," "One True Love" and "Sons of Mistletoe"
Roberts has been nominated for 10 Emmy awards; she won three consecutive Emmys for Outstanding Supporting Actress in a comedy series for "Everybody Loves Raymond," in 2001, 2002 and 2003; the actress also won an Emmy for a guest-starring role on "St. Elsewhere"
Roberts recently completed her memoir, "Are You Hungry, Dear?"